DIVERS SEARCHING FOR 10 missing sailors on a US destroyer that collided with a tanker off Singapore have found human remains, a US admiral said today. 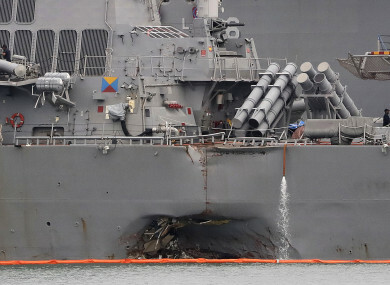 The accident off Singapore, which left a gaping gash in the destroyer’s hull, was the second deadly collision in two months involving an American warship. The US Navy has announced a fleet-wide global investigation after the incident yesterday involving the USS John S. McCain and the merchant vessel. But Admiral Scott Swift, commander of the US Pacific Fleet, praised the surviving crew for saving the ship and saving lives. The accident – which also left five sailors injured – happened before dawn in busy shipping lanes around the Strait of Singapore, and sent water flooding into the ship. Speaking in Singapore, Swift said that “the divers were able to locate some remains in those sealed compartments during their search today”. He said bodies were found during “the diving on McCain today but it’s premature to say how many and what the status of recovery those bodies are”. Swift said Malaysian authorities had also found a body and were sending it to the US Navy for identification. The Malaysian navy said one of its ships had found a body eight nautical miles northwest of the accident site. The admiral said the search and rescue effort, involving hundreds of personnel and several countries, would continue, adding: “We’re always hopeful that there are survivors”. It was the second fatal collision in two months – after the USS Fitzgerald collided with a Philippine-flagged cargo ship off Japan in June and left seven sailors dead – and the fourth accident in the Pacific this year involving an American warship. The incidents have sparked concern that the US Navy could be overstretched in east Asia – both ships were from the Japan-based Seventh Fleet – as they tackle China’s rising assertiveness and North Korea’s nuclear ambitions. The McCain had been heading for a routine stop in Singapore after carrying out a “freedom of navigation operation” in the disputed South China Sea earlier in August, sparking a furious response from Beijing. Yesterday, the Chief of US Naval Operations Admiral John Richardson ordered commanders within a week to set aside time, perhaps “one or two days”, for crews to sit down together for discussions. A “comprehensive review” of practices would also begin. “As you know, this is the second collision in three months and the last of a series of incidents in the Pacific theatre,” Richardson said. This trend demands more forceful action. As such, I have directed an operational pause be taken in all of our fleets around the world. The admiral did not rule out some kind of outside interference or a cyber-attack being behind the latest collision, but said he did not want to prejudge the inquiry. His broader remarks suggested a focus on “how we do business on the bridge”. The damaged vessel is named after US Senator John McCain’s father and grandfather, who were both admirals in the US navy. The tanker involved in the collision, which was used for transporting oil and chemicals and weighed over 30,000 gross tonnes, sustained some damage but no crew were injured, and Singapore said there was no oil pollution. In the June incident, the Fitzgerald collided with a Philippine-flagged cargo ship in a busy channel not far from Yokosuka, a gateway to container ports in Tokyo and nearby Yokohama. The dead sailors, aged 19 to 37, were found by divers in flooded sleeping berths a day after the collision tore a huge gash in the ship’s side. A senior admiral announced last week that the commander of the destroyer and several other officers had been relieved of their duties aboard their ship over the incident. Email “Human remains found in search for missing US sailors in Singapore”. Feedback on “Human remains found in search for missing US sailors in Singapore”.